For music that’s supposedly pop, and sweet, and innocent, Sheffield’s pop group, Slow Down Tallahassee certainly knows how to disguise the dark, crude reality of their words underneath their seemingly, pleasing pop melodies. But this isn’t anything relatively new, the Danish rock-duo; the Raveonettes have also dabbled in the territory more than once, coating sweet, charming music over well……, not-so-sweet lyrics. But these bands approach the subject in such a subtle and obscure manner, it rarely goes noticed. Besides, with all the snaring synth and thick layers of fuzz, it’s usually hard to comprehend what the singer is trying to mumble through the speakers.And although music equivalent to this will always be misleading and the lyrics will always be a ‘little’ unsettling, perhaps all these factors is what builds up to the band’s whole appeal. 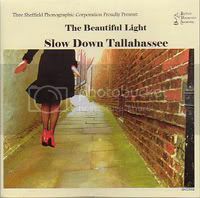 But lyrical contents aside, Slow Down Tallahassee’s newest record, The Beautiful Light, does offer an assortment of brilliant pop tunes. This is definitely one of the best pop bands, that champions the lo-fi, 60’s girl group harmonies, to have surfaced this year. Plus, the band’s debut record is just equally superb and one that’s not to be overlooked.